Hi, It`s me, Lula! I`m very happy because I have an adoption pending! Woohoo!!!! Please do check out all the other African Greys who are available. Hi, my name is Lula. 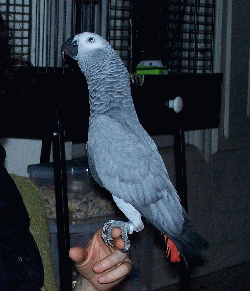 I`m a lovely Congo African Grey, only seven years old. My owner doesn`t have the time to give me the attention I need so she asked Mickaboo to help find the perfect new home for me. I step up on my Mom`s hand I can be a little shy with strangers. I like to eat Zupreem pellets, parrot mix and fresh veggies. I`m a very good talker and can say lots of cute things. I like to put my head down and up like I`m hiding and then says "Peekaboo." Of course I say a number of things like" sleepy time" when mom covers me at night, "how`s it going", "good girl", "hi mama", and so on. If mom drops something that makes a noise, I say "Oh" like `cause I know it was a mistake. If the phone rings, I say "hello" and have a mini generic conversation. I`m smart and really make connections to events and I do talk quite a bit. If mom asks me for a kiss,I`ll lean forward and make a kiss sound on her lips. I like to be petted on my head, but I`m not too cuddly other than that. If you would like to learn more about me please click on the link to contact my adoption coordinator.